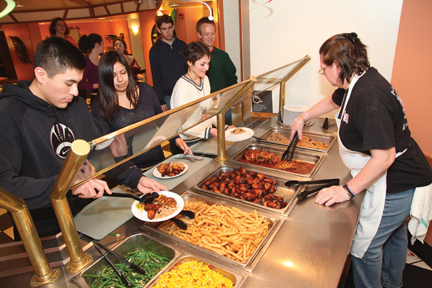 For the uninitiated, Sharples food bars offer a variety of mealtime selections around a central theme. The theme can be regional or ethnic—as in falafel and fajita bars—or it can feature a particular type of food, such as salad and even oatmeal. A regular lunch bar (shown at right) is called Puppy Club Bar with Texas Tommies. Bars are offered at breakfast, lunch, and dinner, and they include vegan and vegetarian choices along with meat-based dishes. 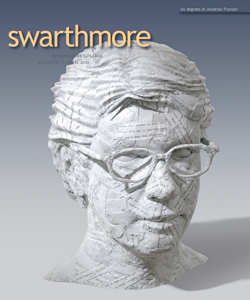 Between them, Sharples Executive Chef Benton Peak and Menu Planner and Director of Purchasing Janet Kassab have decades of experience feeding Swarthmore students, incorporating culinary trends along with the tried-and-true.